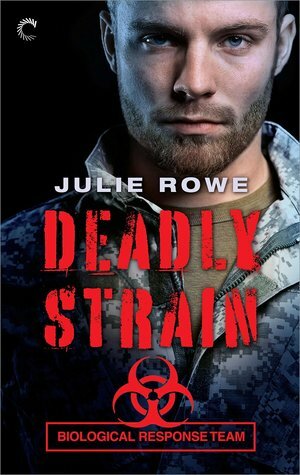 Deadly Strain is a great start to a series with lots of potential and Julie Rowe handles it quite well. I would call this a Romantic Suspense/Military Romance/Medical Thriller type of book... sort of. The ideas and the premise are promising, the characters are created well, and I love me some good action and page-turning progression with fun character banter between all the characters. But the story seems to fall a little short in the romance area despite the great bond and relationship development between Grace and Sharp. Otherwise, I'm intent on continuing with the rest of the series as there seems to be a nice little underlying, ongoing conflict traversing each installment of the Biological Response Team series. Grace Samuels is a military medical personnel--a trauma surgeon and a specialist on the Biological Response Team. It is her job to see to the health status of soldiers on the field and to identify potential hazardous biological entities. Jacob "Sharp" Foster is a Special Forces Green Beret; a sharpshooter who is part of the team assigned to oversee the protection of their Biological Response Team specialist. A weaponized strain of Anthrax found in a village of Afghanistan propels Grace and her Special Forces team into a race against time. They need to find out why this new strain of Anthrax kills so quickly. They need to find the culprit who released the bioweapon. And they need to figure out this terrorist plan and stop it. Meanwhile, other chaotic meltdowns are going on within the military base Grace has been assigned to, and an old tragedy continues to haunt her even as she does her best to remain collected in the face of danger. Again, this book has a lot of potential and the only thing I would have liked would be to see more of the chemistry between Sharp and Grace as their romance develops. Sure, they have a great relationship and bond. Sure, they read each others' minds like soul mates and watch each others' backs like a perfect team. The banter is great, the friendship is great... But I feel like I'm missing some significant detail into how their relationship grew to be so strong in the first place. You get to see some of it happening as the book progresses, but I still feel like I'm missing something. In the same sense, I also feel like I had missed something in the bond between Sharp and his fellow A-Team members as well--running jokes are passed around casually, but it almost makes me wonder if there had been another book somewhere where all of this started. Or maybe the book was just so fast-paced that I missed what I need to see when I blinked a few times. Other than that, the rest of the book was pretty entertaining and enjoyable. There were a heck of a lot more deaths than I would have preferred, but the gritty, realistic stance on the casualties of war and battle were appreciated. This is war--not everyone is going miraculously come out in one piece. Although, even with that, there's a lot of feels and significant emotions missing from the narration itself. Apparently, I can't be pleased. Whatever, Deadly Strain was an enjoyable read and I liked it.